Today I made three versions of my card. I started by using the Faux Mother of Pearl technique (click HERE to see my video tutorial). I sponged on bright yellow and bright green over top of the pearl resist. Love these colours together ... so fun! :) I used the same sentiment for all three cards, and also used the same splatter background for the first two. I'm also using a new-to-me two part butterfly die that I got for Christmas. I didn't realize until I cut my first butterfly that it doesn't cut all the way through. Instead it leaves the body attached and the wings are loose so you can pull them forward to add dimension. So cool! 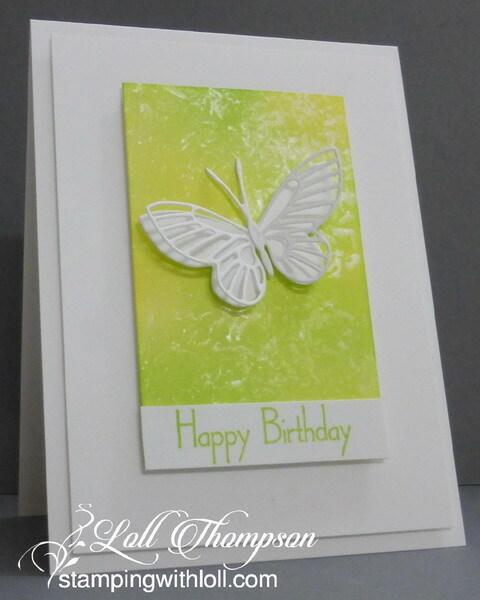 I used as it was intended for the first card, with the butterfly partially cut from the card front and faux mother of pearl panel in behind (also partially die-cut). And I used it as a regular die for the second card (just cutting to detach into a separate die-cut butterfly). And since I had a little bit of my faux mother of pearl card leftover, I created a third card using a small panel. I used a smaller die-cut butterfly to better balance the design ... the large butterfly used on the first two cards was too big. Labels: birthday, CAS, CAS mixed media, faux mother-of-pearl technique, Happy Little Stampers, memory box, sponging, Stampin' Up! Wow! These are absolutely gorgeous! Love the mother of pearl, and the wonderful butterflies! Wow! Three stunning cards. I love your choice of colour it makes me remember that Spring must be around the corner! Love the top card the best. All three areamazing but the top one has that color combo that is beautiful!! This IS such a fun, spring-time & just happy color! Love this butterfly & so glad Santa knew it needed to get into your hands. Love each one of these cards, and clever you, to be able to create such pretty designs with the leftovers from #1! All 3 are gorgeous, and you have 3 birthday cards at the ready! TFS & Big Hugs! 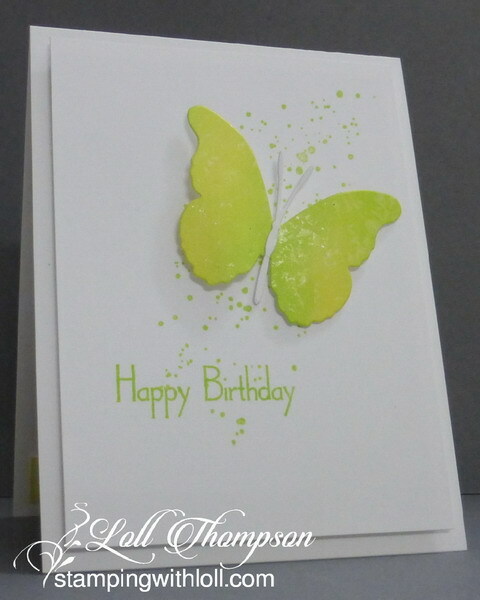 Love these crisp, citrus colors and Memory box does the best butterflies! I have trouble picking a favorite! Beautiful cards. Love the combined color and the beautiful butterflies. All three are just beautiful and love that lime color, SO summery! That is a great die! Love the way the layers look with it. Thanks for listing your supplies too! That way I know what I want when I shop. A trio of sponged beauties, Loll. Love the colors, too. So fresh and bright. Thanks so much for playing along at Time Out Challenges. What gorgeous zingy colours you've achieved Loll. Makes your mouth water! Love all 3 designs and it's great you've managed to make 3 cards out of one piece of faux mother of pearl card. These are all so very petty. The pearlescent one is my fave...have not tried that technique yet! Such a beautiful Spring green for your beautiful faux mother of pearl colored butterflies Loll. Looks like you were having so much fun playing with your new toys:-) TFS my friend. Beautiful cards Loll love the zingy citrus colours! Each one is beautiful, Loll! Fabulous colours, and your faux mother-of-pearl technique always looks gorgeous. All three of your cards look so gorgeous! Love the shimmer and the fresh green! Thank you for taking the TIME OUT and join us again! I love when you use this technique, Loll...the effect it has on your butterflies and panel is just stunning! 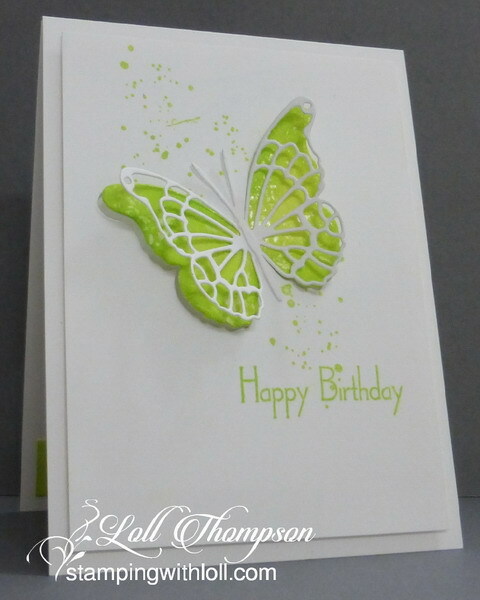 Loving the fun shade of green you achieved with your distress inks, too...so pretty!